The Rebel Sweetheart. : Pucker Up! 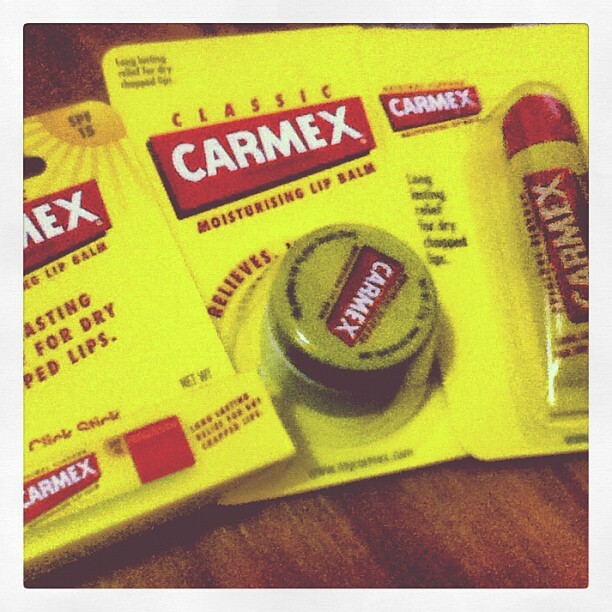 | Carmex Lip Balm. When I posted this photo on Instagram a couple of days ago, I knew my Mum wouldn't fail to notice it. And notice she did. She even left a comment saying, "Oh, that's not new here. But very, very good." By 'here', she meant in London, where Carmex happens to be a household brand. These lip balms sure are popular! From their lab in Wisconsin, the brand has a following that spans across the globe. Invented in 1937 by Alfred Woelbing, Carmex began as a small business for the Woelbing family. Alfred Woelbing concocted the lip balm on top of the family stovetop and hand-poured the mixture into small glass jars. Together with his wife, they sold these jars to pharmacists from the boot of his car. The popularity of these yellow-capped jars remain up to this day. Only now, they're no longer contained in glass, but in plastic jars. And they sure have gone a long way from being peddled to pharmacies. Aside from the classic jar packaging, Carmex lip balms now come in sticks and tubes, too. Click Stick + Squeeze Tube. I was actually very excited to try the Strawberry Stick first. Remember, I'm a sucker for anything strawberry. Plus the fact that it has sunscreen protection of SPF15. But alas, someone made a mistake of sending me an empty box! So I went on to try the Squeeze Tube instead. Its formulation is the same as ones contained in jars. Active ingredients are menthol (to kill germs and alleviate discomfort), camphor (to ease the pain of chapped lips), and phenol (to numb sore lips and remove dead skin). Sounds a lot like Vicks Vaporub? Right you are. That was my initial reaction when the lip balm came in contact with my lips. I was like, "Wutda?! Vicks?!" The tingling sensation and the waxy feel was a bit overwhelming at first, but I got used to it after awhile. - It's now available locally. No more pre-ordering from US sites or waiting for balikbayan boxes, lol. - The sunscreen protection (found on the Click Sticks). - The light, vanilla scent. - The empty box, lol! Visit the Carmex website to know more about their products. Like them on Facebook, and follow them on Twitter, too! *I received these products for free for review purposes. Thoughts and opinions stated above are entirely my own. Aww too bad about the empty box! 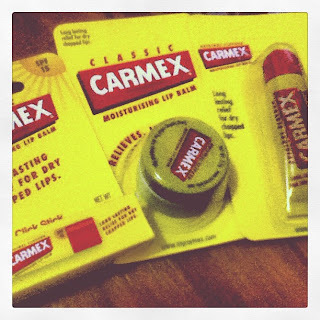 Raised your expectations only to disappoint :( I've never tried Carmex before. Will be on the look out for these. So far though, havent seen these in the malls yet. The squeeze tube seems really convenient to use. Haven't tried this lip balm yet. I'm surprised it's cheaper than Burt's Bees pala. It's on my list of my next buys, ang tagal kasi maubos ng Burt's Bees. Interesting . . . Vicks, huh? On the lips? Eeuww! Not my cup of tea, lol! It is indeed a good product. Speaking of Vick's, my sister lives by it. It will cure anything in her book.